Krokus have announced their intention to split following what will be a 2019 farewell tour. The band have released 18 studio albums since forming in Switzerland in 1975, their last being 2017 cover album Big Rocks. But in a message on Facebook, the band say the end of the road is drawing near. The statement reads: “Krokus shows have always been special and should stay that way. That's why we decided to stop when it's still really good. That's how the fans should remember us. 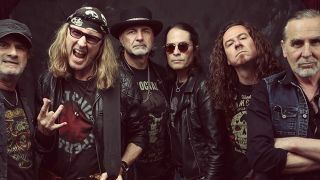 While tour details have still to be announced, Krokus have revealed that their final show will take place at Zurich’s Hallenstadion on December 7, 2019. Vocalist Marc Storace says: “We look forward to a grandiose 2019 Adios Amigos World Tour with the final highlight in Switzerland." Lead guitarist Fernando von Arb adds: “We have signed reciprocally contracts with each other that it really is over. We will stick to that. Every party has to end eventually." Founding member Chris von Rohr calls the band’s history “an unparalleled journey with all the ups and downs rock life has to offer” and adds: “Now we are looking forward to the final lap of honour and will give it our all once more.